The LPD AAUW Local Scholarship Foundation is a project of the Livermore-Pleasanton-Dublin Branch of the American Association of University Women. The Foundation awards scholarships to qualified applicants each year who will be either juniors or seniors in college during the upcoming academic year. The LPD AAUW Local Scholarship Foundation is a 501(c)(3). Most fundraising is done within the branch through an annual non-event. Donation letters for this year’s event have gone out in the mail to all members. Through your generosity last year, we were able to raise $6,000 and provide scholarships ranging from $500 to $2000. We would love to meet or exceed that goal this year! The 2019 AAUW Local Scholarship Application is now available. LPD-AAUW awarded three scholarships in 2018 due to the generous donations from our members. Samantha Valdez attended Granada High School in Livermore and is now attend ing U.C. Berkeley. She is majoring in Women’s Studies with a minor in History. When Samantha was eighteen, she set up an Outreach Program to build a water well in Ghana. She has been an intern for Congressman Eric Swalwell in his Castro Valley office and was hired as his district scheduler. She has received several honors including Psi Beta National Honor Society and a Golden Key Honor Society. Her goal is to obtain her teaching credential and teach Women’s History. 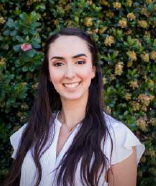 Roujheen Sabetan comes from Pleasanton and graduated from Amador Valley High School in 2016 as an AP Scholar with Distinction. She recently completed two years at Las Positas College and received an award for an outstanding student in Cell and Molecular Biology as well as our AAUW Tribute to Excellence Award. She will be transferring to U.C. Berkeley this fall as a a public health major with an emphasis on nutrition. Roujheen has worked as a nanny and private tutor and also has volunteered at Axis Community Health Clinic in Pleasanton and Livermore. She has spent time serving as a peer mentor for middle schoolers in the Tri-Valley area. After graduation, Roujheen hopes to obtain a masters’ degree in public health, focusing on community-based settings and underserved health. Amber Barnstead graduated from Amador Valley High School in 2015, then went on to study at Las Positas College in Livermore. It was there that she found her passion for Political Science. She graduated from Las Positas College with highest honors and enrolled at Sonoma State University. Amber has completed her first semester there, majoring in Political Science and minoring in History. She hope to work in local government and have positive impact on day to day life in a community. Each year we have a non-event fundraiser, giving you the opportunity to donate to a good cause without purchasing a ticket, buying a new outfit or leaving your home. The themed fundraiser letter offers suggested donation amounts based upon activities or interests you might actually want to purchase or bid on if you were attending an actual fundraiser. Anyone can donate. Membership is not required! Donations should be made to AAUW/LPD Local Scholarship Foundation. Contact our fundraising event chair to make your non-member donations. Thanks to our generous members, donations have reached $6,000, the highest amount ever. These donations will go to fund scholarships next spring, and there is still time to make your tax-deductible donation (see above).